Design changes can assist with safety and ease of bathing for older homeowners. They include replacing the tub with a larger shower area, and adding shower seats and grab bars. The concept of “aging in place” is becoming increasingly popular in home design, not only for seniors but for anyone who wants to create a comfortable, safe living space for years to come. Q: My widowed mother doesn’t want to leave her condominium, but she’s had several falls already and has difficulty standing for more than a few minutes. What can we do to make her home safer and more usable, particularly when bathing? A: The concept of “aging in place” is becoming increasingly popular in home design, not only for seniors but for anyone who wants to create a comfortable, safe living space for years to come. Bathrooms especially pose safety challenges: floors can become slippery when wet, large jetted tubs can be difficult to get in and out of, and shower stalls often have narrow entries with a curb that must be stepped over. Even if changing the footprint of the bathroom is not an option, several design changes can assist with safety and ease of bathing. Remove the tub and enlarge the shower. If the tub is not used frequently, or has become a danger, removing it will leave room for a larger, walk-in shower. 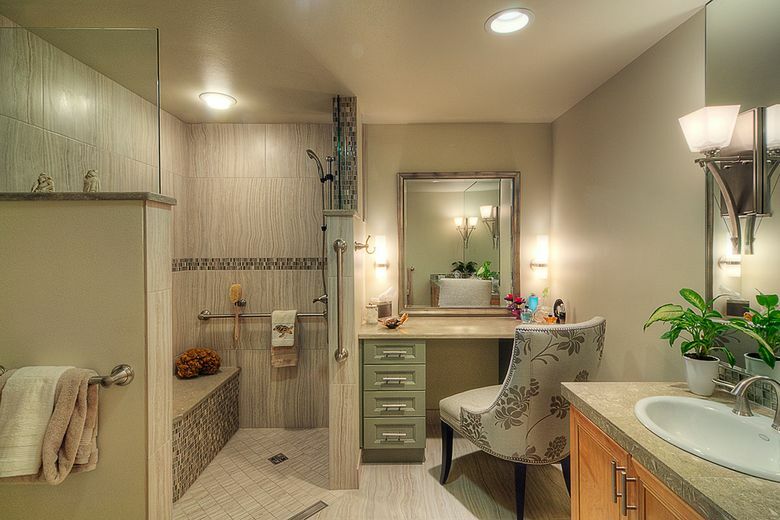 If space allows, go for a “wet room” concept, which creates an easy-access opening by eliminating the door. A shower door can be a hazard to someone with mobility issues, since the person needs to maneuver around it — and may even try holding onto it for stability. Making the shower large enough for two people will allow a future caregiver to assist with bathing. Add a shower bench. For seniors who have difficulty with balance or with standing, it’s important to provide ample seating throughout the bathroom. A bench allows them to sit while showering. Install a multiple-positioning showerhead. Even if you’re designing the bathroom for a specific person, you’ll want it to be usable by others, as well. A multiple-positioning showerhead can be mounted on a vertical adjusting grab bar for use when standing, and moved to a horizontal grab bar for seated showering. Make sure the fixtures, including temperature controls, are easy to grab and adjust. Include a linear drain at the shower entry. Installed in place of the standard shower curb, a linear drain provides a visual cue for the homeowner at the floor entry, and also collects excess water to help prevent slipping. Use slip-resistant tiles. A tiled shower floor can provide more slip-resistance as well as durability and easy maintenance. Look for tiles with a little texture, but not so much that they create an uneven surface. Don’t forget the grab bars. You should install multiple grab bars, both vertically and horizontally: at the entry wall, at the toilet, at the vanity, and inside and out of the shower stall. Grab bars can double as towel bars, but don’t try to use a standard towel bar as a grab bar, as it’s not designed to hold body weight. Other design considerations include large-handled cabinet hardware for easy gripping, lighting that is bright and easy to use, and wide doorways with no height changes. Specialists can help you determine accommodations that will best suit your current and future needs. For more information, consult a Certified Aging in Place Specialist (CAPS) designer and remodeler, and your occupational therapist. Cathy Briskorn is an interior designer with Albee Interior Design LLC, and Joseph Irons is the general manager of Irons Brothers Construction Design + Build Center. HomeWork is written by member professionals of the Master Builders Association (MBA) of King and Snohomish Counties. If you have a home improvement, remodeling or residential homebuilding question you’d like answered by one of the MBA’s more than 2,800 members, write to homework@mbaks.com.